Cork is an unbeatable seal and bottle stopper: Cork is still better then the stamped aluminum for the good wine and not just for nostalgia's sake. Cork's been doing the same job well for thousands of years. Ceramics with cork tops were tucked into Egyptian tombs, and the Greeks shoved the spongy wood in containers filled with wine and olive oil. But it wasn't until Dom Pérignon developed the process for Champagne production in the 18th century that the cork stopper got its boozy break. At the time, French sparkling wines were plugged by old wooden pegs wrapped with olive oil-soaked hemp. The gas in wine kept popping the slick stoppers out. Without a proper stopper, wine was losing its sparkle and the appeal of Champagne was falling flat. So as a way to seal his beverage Dom Pérignon started a series of experiments to find a better way. That's how cork got a standard for the entire wine industry. In the early 1800s, a a two-masted schooner sank in the Baltic Sea near the Åland islands. In 2010, divers found the ship with its structure largely intact with a cargo hold that was empty apart from 168 champagne bottles. After 200 years, the champagne was still intact due to the unbeatable characteristics of natural cork stoppers. Cork is resilient and performs extremely well under pressure: With some nudging, cork can compress to half its size, without bulging out the other side or increasing its length. There are a lot of things that can do that if you push them hard enough, but the key here is cork's resilience. Cork's insides look like a honeycomb filled with gas - 89.7 percent gas, in fact - which makes it both light and buoyant. And the cells that make up the honeycomb are very stretchy. So the cells can stand to be squeezed tight like the skinny neck of a wine bottle. But cork doesn't collapse under the abuse. Although the gas in the cells is compressed and loses volume, it is always pushing back, which allows it to seal cabernets and champagnes. Even after years of abuse, the cork doesn't lose any integrity in its cell structure. It goes right back to its original form. Cork is the best wine keeper: If you're keeping wine in a cellar for a long time, a little bit of air does a body good. The reason is that wine contains a little bit of sulfur dioxide. But without oxygen, that sulfur disintegrates and creates a smell like a struck match. Cork adds air naturally by releasing a bit of its stored gas, maybe 3-4 milligrams. Screw caps are either hermetically sealed, leaving bottles with a potential sulfur problem, or they've been engineered to allow a little outside air in. While that little bit of air is good for the sulfur, but not good if it's sucked from a wet cardboard or musty cellar. Cork's gas release doesn't come from the outside, so it doesn't smell. This means that when it is time to pop the top, both wine and cork come out unscathed-the wine appropriately aged and the cork looking almost like it always did. Cork is a versatile raw material: Cork adopts different technological transformation processes which can be used in many applications. Even NASA uses cork for its high tech equipments. Among the most noteworthy groups of cork materials available on the market are natural cork, granulates, composite agglomerates and expanded agglomerates. Cork offers industrial designers a number of product-technology options that can generate potentially new sustainable and innovative product design solutions. Cork is a sustainable material: Cork is an organic, natural, recyclable, non-toxic and renewable material. Cork products have a natural life cycle and are therefore eco-efficient. That's why cork is a material for the future. Why cork? View the general cork information in a nice animated movie suggested by the Portuguese Cork Association. Click here! 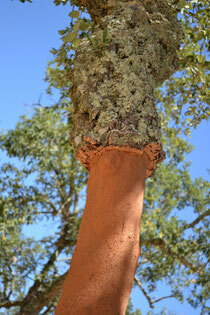 Copyright JVZ Natura Cork Portugal Lda.